In Revit, all of us are striving to be as productive as possible. In some specific industry disciplines, various Revit add-ons can give you a real edge. 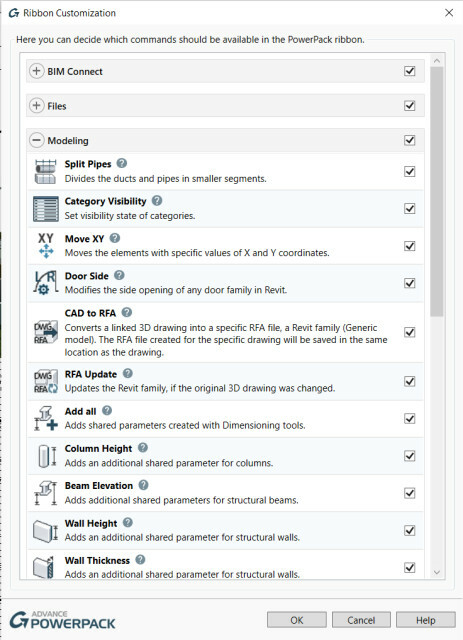 Having spent some time looking at ways to automate various Revit modeling tasks, I was interested to see how I could benefit from the newly updated GRAITEC Advance PowerPack for Revit. In this review, I will consider these points as part of an in-depth consideration of GRAITEC PowerPack for Autodesk Revit. To find the software, you can go to the Autodesk App Store and search for Revit for PowerPack. There are two options try or buy. I selected the Trial version, which allowed free five-day access. 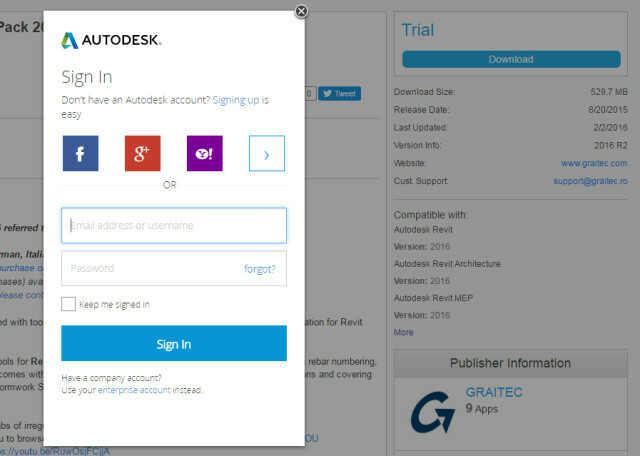 Click “Download.” Once you sign in to your Autodesk Account, click the Download button. Figure 1 shows the Autodesk Sign In screen and Download button. Figure 1. Autodesk Sign In screen at the Autodesk App Store. The download is 530 MB. You either add the URL to your download manager or download directly (see Figure 2). 500 MB is a couple of minutes even on a slow connection so you may choose to download directly. Figure 2. The Autodesk App Store gives you option to download directly or add to download manager. After downloading, use the RevitPowerPackSetup.msi to install this latest version of PowerPack, as shown in Figure 3. Figure 3. Version installed for this review. Following the install, you will probably have to restart Revit. When you start up Revit 2016, you should see a brief splash screen for the newly installed PowerPack. 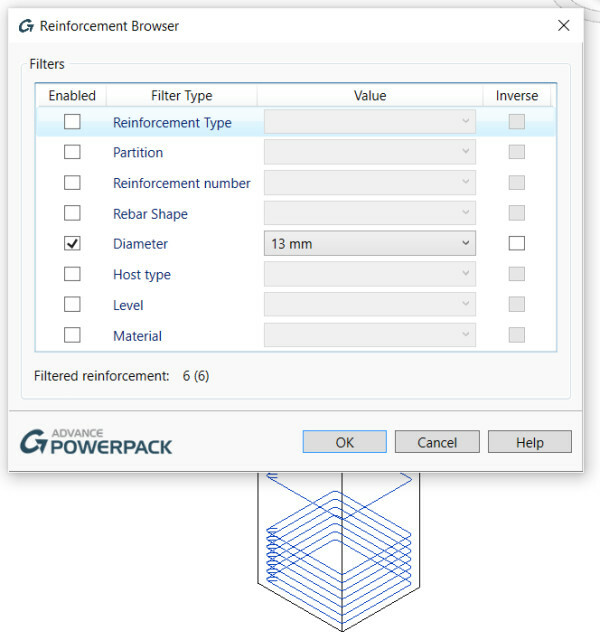 In Revit, the newly installed GRAITEC PowerPack ribbon is jam-packed with many features and functionalities to explore (see Figure 4). Figure 4. GRAITEC PowerPack ribbon. One thing that immediately catches the eye is the Ribbon Customization option (see Figure 5). This allows you to choose which tools are shown on the ribbon. By default, the pack is configured with all tools enabled. Figure 5. The Ribbon Customization feature allows you to modify the PowerPack ribbon buttons. The BIM Connect panel provides various tools for importing, exporting and synchronizing your project with other utilities available from GRAITEC. The Files panel provides a number of ways to manage multiple families, including a batch upgrade tool. The first time you launch the Family Manager, it will perform a search and build an index for the content located on your system (see Figure 6). The search will go through the content included with the PowerPack (usually located in the Libraries folder related to GRAITEC Program Data). I found there were well over 1,000 Revit family (RFA) files provided in the library, spanning across multiple different locales, which is a generous offering indeed. Figure 6. First run indexing by the Family Manager. 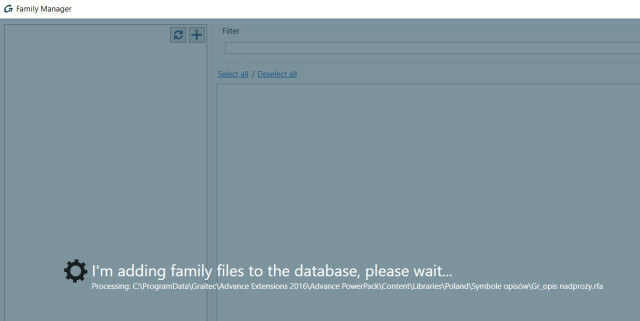 The Family Manager allows loading of multiple families from various libraries at once, and it also provides the ability to only load specific types of a family. The filter option allows you to search an entire library for families matching any criteria. Also, on the Files panel, you will see a Family exporter. Revit users may think they already have this in Revit out of the box because it has similar features, but look closer and you will find that the Family exporter allows you to choose a family, and even which type or types they wish to export. Revit out of the box only exports all or one family at a time. More interesting is the Watermark Manager. This can scan RFA files for a special watermark, and add one if none is found. This is one of those more unique capabilities of the software, and certainly something to consider if you are an intellectual property–conscious Revit user. Moving on, the Modeling ribbon contains some of the more exciting tools in the suite. There are some very unique and powerful functions here, including the ability to modify the Category Visibility of a view using a dialog that has a filter ability, along with a Split Pipes option that can split ducts and pipes after you input a maximum segment length for each. There is the ubiquitous Auto Section Box ability for 3D views, but also a more powerful 3D View For Each Level button. This is useful for clash detection and coordination, as it allows quick creation of sectioned views. When running clash detection in Navisworks, it is often useful to work with models divided by Level, and the 3D View For Each Level tool allows the batch creation of these views to facilitate this typical workflow. Hiding behind the 3D CAD Visibility drop-down list is something I have honestly not seen before: a linked CAD to RFA converter. I had to test this immediately. I linked a relatively complicated 3D CAD file containing a piece of furniture into my current Revit session and triggered the CAD to RFA tool. As I already had the linked object selected, CAD to RFA immediately kicked into action. In quick time, it created a component Generic Model family, imported the CAD file, saved the RFA and loaded it into the project in the correct location—all with the click of a single button. The software also creates a text parameter showing the path to the source DWG file. I can see some immediate benefits for this tool, as families are inherently more useful than links when it comes to phasing, visibility and the ability to cut and view them in sections with a bit more predictability. However, there is an even more impressive part to this little feature: the ability to update the Family based on the CAD file. This is called RFA Update, and essentially it works by checking the source-linked file and updating the geometry in the family if anything has changed. The RFA Update tool is run after selecting one of the previously converted linked file families. Again, it worked predictably and updated the family based on the DWG file. This is a powerful and unique tool, and something that can both improve and clean up the quality of Revit models in general. Revit users often chafe at the lack of certain text and annotation tools available in vanilla or out-of-the-box Revit. However, GRAITEC has responded to those needs and presented a number of time saving utilities in the Annotation panel of the suite. Some of those tools, such as Auto Dimensioning, logically require that a 2D view, such as a Floor Plan, is active in the current session of Revit. This tool does a surprisingly good job at creating multiple strings of dimensions, based on your selection of grids and walls. You can actually do a crossing window to select all of the visible grids and walls in the view, and then in a few clicks you have a set of multiple, neatly spaced dimension strings. These may require some tweaking after placement, but there is definitely a time saving benefit provided by the Auto Dimensioning tool. The same could be said for the Quick Dimension button, and you are also given the ability to Join Dimensions together to form a connected set of dimension segments. When working on large and complicated Revit projects, it is highly desirable to have the ability to standardize model naming, and this includes modifying the case of text elements. The Convert texts dialog has options to convert to Upper case, Lower case or Title case, and can operate on Text notes, Model text, and even View name across the entire document in one operation (see Figure 7). As company standards related to Upper case or Lower case can vary considerably, having a tool like this to immediately change a View name to Upper case or Title case is very powerful indeed. Figure 7. Convert texts tool. It is quite common now for users to link Excel data into and out of Revit, and this is accomplished through a number of different add-ons. You can even use a tool like Dynamo to import and export Excel data to elements in your model. However, being able to purely import Excel data without a model relationship is actually much less common. Think of those scenarios in which you have a table of useful and detailed information in Excel, and you would like to link that table into your Revit model and perhaps use it on a documentation sheet. Happily, GRAITEC has considered and provided an answer to this problem with the Worksheet to DXF utility, available in the Document panel. This uses a two-step process. In step one, Worksheet to DXF converts an Excel spreadsheet directly to DXF. In step two, the Revit user then must link that DXF into the desired view in Revit. Because the DXF is truly linked in Revit terms, it can be updated and reloaded back into the Revit document. The Excel to DXF conversion can handle bold and italic text from the Excel cells, and also Border conditions (i.e. whether there is a border to this cell or not). However, it doesn’t handle font colors or border colors. In some ways, this feature is a workaround, but it does answer the question that is often asked: How do I get this Excel spreadsheet onto my Revit drawing sheet? There is a very handy little Windows panel, which provides tools that let you tile and resize Revit view windows in certain ways. Also, the Center button will effectively perform a Zoom To Fit operation on all open views. This is something you could immediately add to your Quick Access Toolbar. Having a broader look at the PowerPack, it can be seen that some of the functions are certainly targeted toward the structural engineering and detailing disciplines, such as the Center of Gravity symbol placement. These industry-specific tools will be considered in the next section. The Reinforcement panel is certainly generous in terms of the number of new features it provides, and it gives insight into where GRAITEC has generated its core business (see Figure 8). Figure 8. Reinforcement tools in the PowerPack. The Rebar Visibility tool wants to be run from some model view in Revit, as running it from a Drafting View will simply not work. It provides a number of ways to override and view rebar across all views in your entire Revit document, regardless of the individual view settings. The Transversal Distribution tool allows for automatic, distributed placement of structural rebar in certain supported elements, such as structural columns. It is extremely easy to start placing reinforcement in elements with this tool (see Figure 9). Figure 9. Transversal distribution allows automatic placement of rebar. 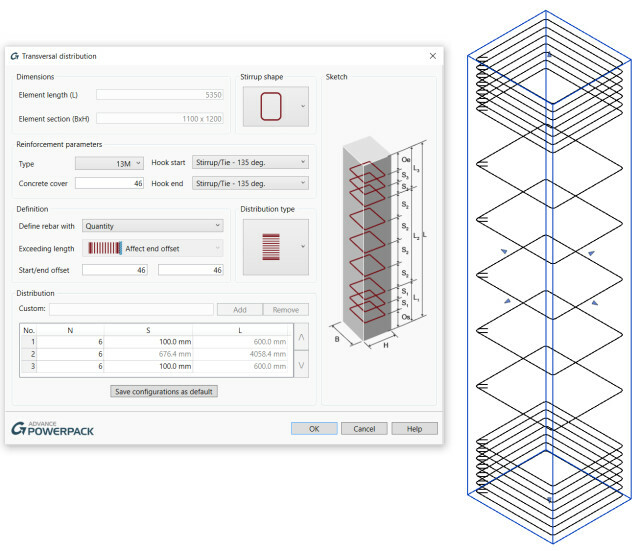 In terms of managing rebar, you can easily Explode Rebar Sets and Unite Rebar Sets with the GRAITEC PowerPack for Revit, as well as cut openings in modeled Rebar Sets. In addition to all of these ways to create, manage and modify rebar, there are also numerous tools that allow you to select, annotate and Renumber Reinforcement. The Reinforcement Browser provides a simple, property-based method to filter desired rebar types in the current view (see Figure 10). Essentially, GRAITEC has identified a number of pain points (items that are difficult to handle in Revit alone), and solved them with these additional tools in the PowerPack. PowerPack for Revit 2017 is right around the corner (expected to ship in June 2016) and we hope to bring news of more useful tools in a future review. Figure 10. Reinforcement Browser allows highlighting by property value. In Revit, assemblies are useful ways to collect repeating sets of elements and develop the documentation for them. 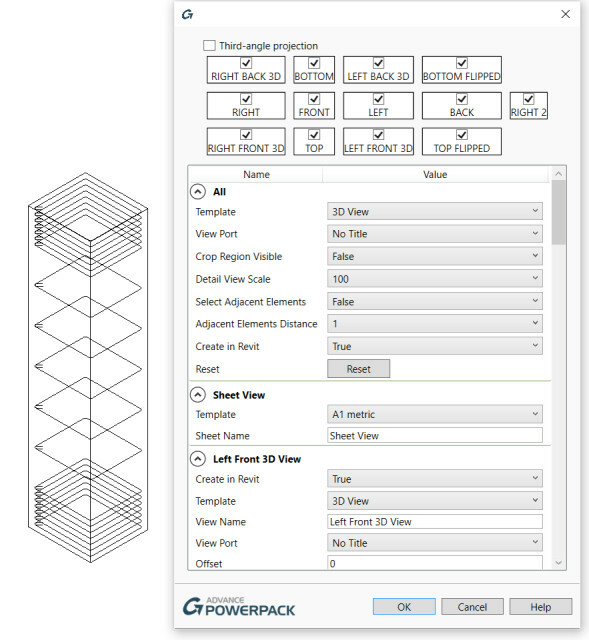 The Precast Tools panel in the PowerPack gives additional incentive to use Assemblies, and allows you to spend less time creating views and placing them on sheets. The main tool in this kit is the View Sheet Generator (see Figure 11). It allows automatic creation of views and sheets for selected assemblies, and there are many different options available to suit your desired documentation workflows. Also provided are Include and Exclude tools to control the appearance of Assembly components in Schedules. Figure 11. The View Sheet Generator. GRAITEC PowerPack for Revit is an impressive suite of useful Revit tools that covers a broad range of different use cases. There are some genuinely unique features, along with some solid time savers, not to mention the excellent set of Reinforcement Tools that will be extremely attractive to those who are involved in rebar modeling and detailing. All in all, this is a good quality suite and I recommend you take the time to try it out for yourself. Watermark Manager, used to protect families by adding verification data (see Figure 12). Figure 12. 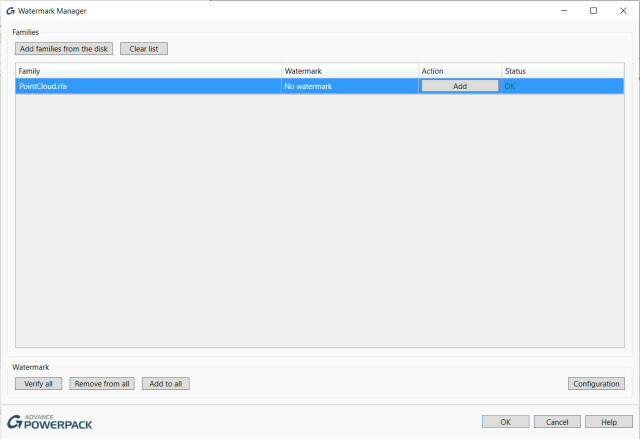 Dialog box for the Watermark Manager. You can access a full set of training and demonstration videos on this page. 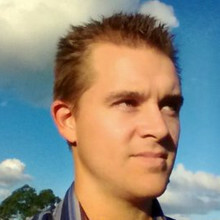 With 10 years of experience as an architectural technician, Luke Johnson’s specialties now include BIM technologist, 3D modeler and Revit specialist. More recently, he has combined his construction knowledge with his technical expertise, working with general contractors performing coordination, clash detection and issue resolution roles on a number of significant projects. In the past year, Johnson has pivoted his skills to focus on custom solution development, primarily using Dynamo for Revit model auditing and quality control.